The world's first configurable, multi-channel, all-in-one pedals-to-amp cable system—a Lifetime Investment in ease and sound quality. 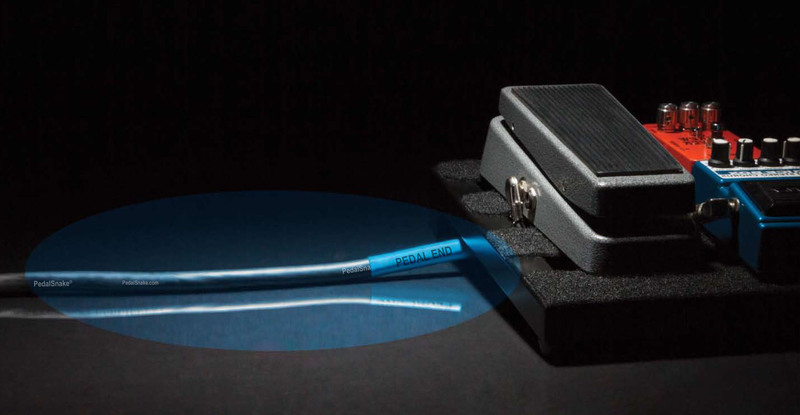 Employing patented technology, a new approach to audio signal cabling uses the low impedance outputs of effects pedals to improve tone and signal-to-noise ratio in guitar rigs. When you are ready to purchase, there are step-by-step instructions at Your System. Guitar rigs change often, so a multi-channel system must be easily reconfigured by the user. 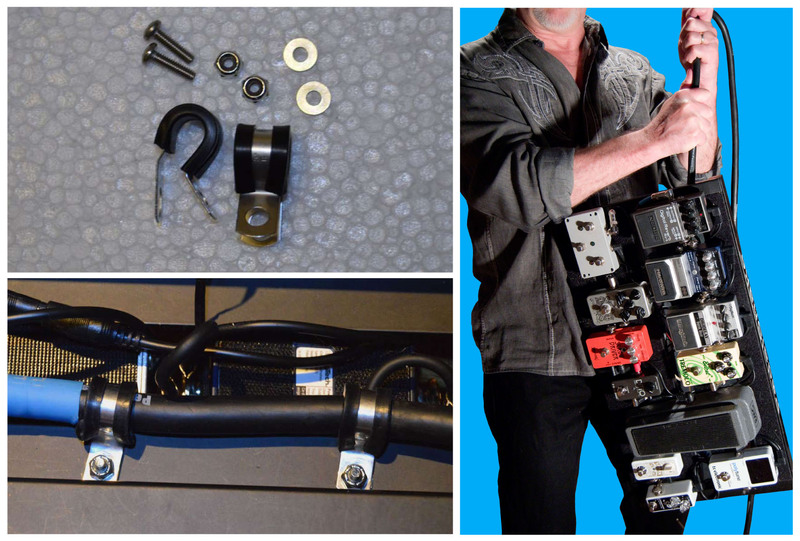 PedalSnake mods so easily, users actually clamp PedalSnake semi-permanent to their pedalboard (see PSClamps under Tour Prep Accessories). It is a lifetime investment they can further ruggedize in a number of ways. Wrapping pedals-to-amp cables in a bundle can produce a heavy, unweildly mass. Thick snakes that carry high voltage AC power can be even heavier. system employs multi-channel low voltage cable, lightweight and flexible, for the most elegant solution. Cables to amp input, effects sends and returns, footswitch lines, MIDI ... even power, can all be replaced by a single PedalSnake system. Users have Three Options for Power. They can choose to keep running an AC power cord to a board-mounted power supply, or choose between 2 options for low voltage power, and run no AC cord. Low capacitance cables apply only to high impedance guitar pickups. 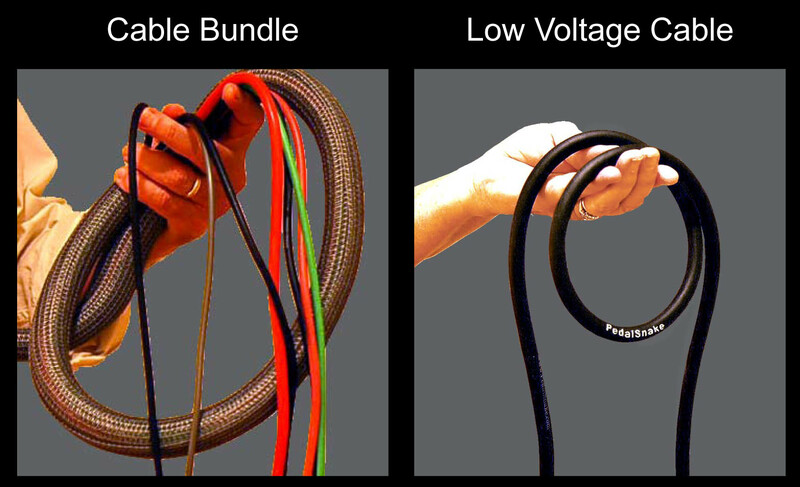 PedalSnake discovered a better design for pedals-to-amp cables.. HiC-LoZ technology uses the low impedance output of the typical effects pedal with shielded twisted pair cable to produce stellar tone and the quietest connection one can have. There are 2 ways to lose the AC power cordthis (see Three Options for Power). The state-of-the-art 24V Method employs Strymon's Ojai or Ojai R30 power supplies, the quietest in the biz, with nothing but quiet 24V DC at your pedals, with no AC power cord in sight. PedalSnake offers Tour Prep Accessories so players can easily setup in record time, and have a bulletproof rig. 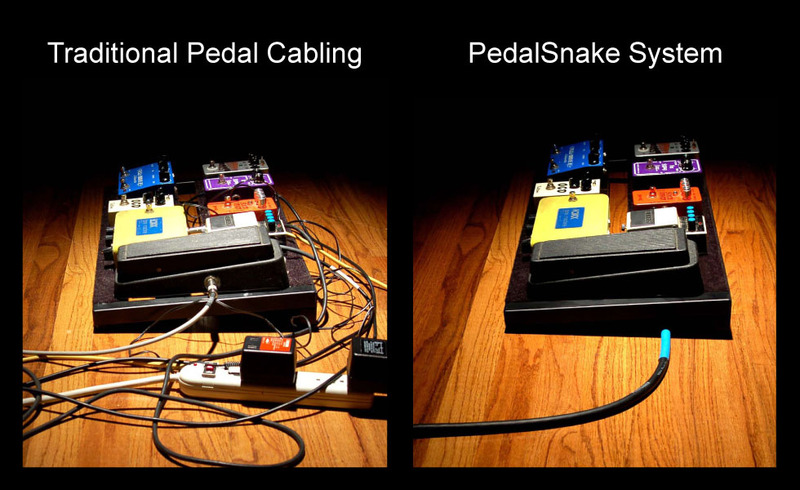 PSClamp kits bind PedalSnake to a pedalboard, with a connection so strong one can lift a pedalboard by the PedalSnake. 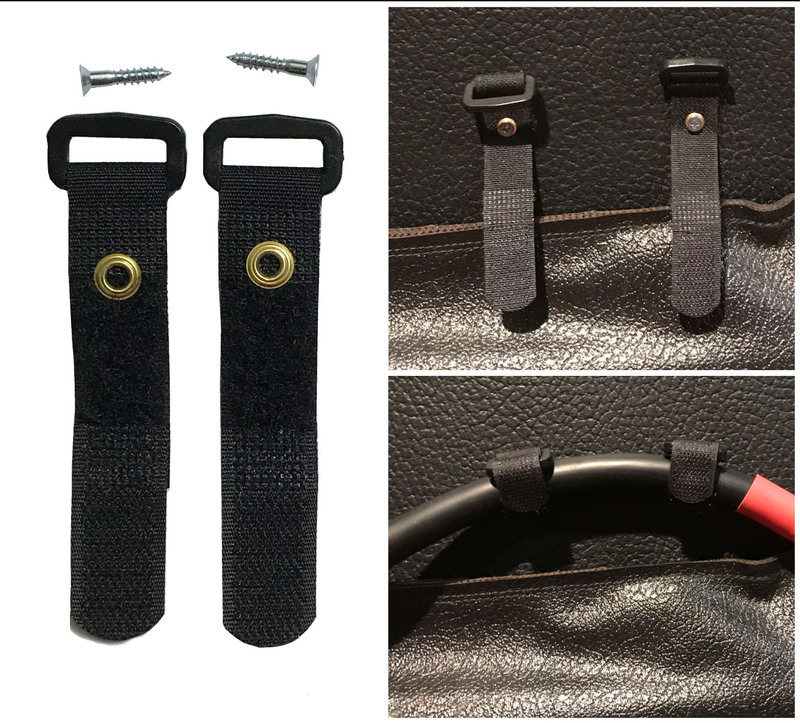 AEStrap kits for the Amp End, mount behind the amp, for quickly strapping into the ideal spot to make all connections while providing proper "snake" strain relief.